This lesson, along with the last one, really made things POP for me Hawkeye. You teach your students how to make music, while some teachers teach only how to play chords and notes, if you know what I mean. Thank you so much the work that you do! Thanks so much for your kind comments regarding these lessons, Will. Much appreciated. I truly love what I do, and I consider myself truly fortunate to have been employed as a musician/performer/guitarist/educator, exclusive of any other kind of work, since 1975. My primary goal is always to get my students PLAYING the guitar and enjoying the process of learning/practicing/playing ... without added stress or worry. I believe that the process of learning/practicing/playing should be FUN, as well as challenging, entertaining, and gratifying. ;-) May I suggest you view some of the many blues songs that I have posted on youtube ... try to play along with me, it's good practice, and try to 'steal' my ideas/licks/riffs ;-): http://www.youtube.com/user/HawkeyeH ... and please be sure to check out/explore my web site for more free guitar lessons and blues history information: http://www.HawkeyeHerman.com ... I hope you continue to enjoy these lessons. 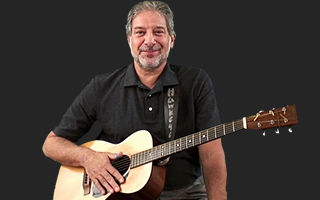 Thanks again for your kind comments and for 'traveling' with me on the 'blues highway' here at JamPlay.com. So glad you enjoyed the lesson, Rama. The difference between a major scale/song and a minor scale song is the flatted 3rd ... flatting the third note of the scale created a minor scale ... flatting the third note of a major chord (a major chord is made up of the I/III/V notes) ... a minor chord is made up of the I/bII/V notes. I hope you continue to enjoy these lessons. Hey,Hawkeye,just letting you know that all you're teachings and all my practice is really paying off.It took me 5 minutes to learn what you just teached and i can actually follow you as you play. Thanks for the comments, Christian. Much appreciated. I'm so glad you're progressing to your satisfaction as a result of these lessons. PLease take a few moments to check out the many videos I have posted at youtube.com ... so that you can see how I use the material I teach here at JamPlay.com when I'm performing: http://www.youtube.com/profile?user=HawkeyeH&view=videos .... and try to play along with me ;-) Again, thanks for the kind words. I hope you continue to enjoy these lessons. this video quality is pretty bad. very choppy. ALL of my jamplay videos are all choppy now! This is very frustrating. I can't recreate the issue on my end either. Tyler is right, a lower quality should help. Otherwise, shoot us an e-mail and we'll give you some things you can do that may help. Have you tried to view the lesson on a lower Quality? It was only a modem issue. I restarted my modem and router and all my videos are back to normal!